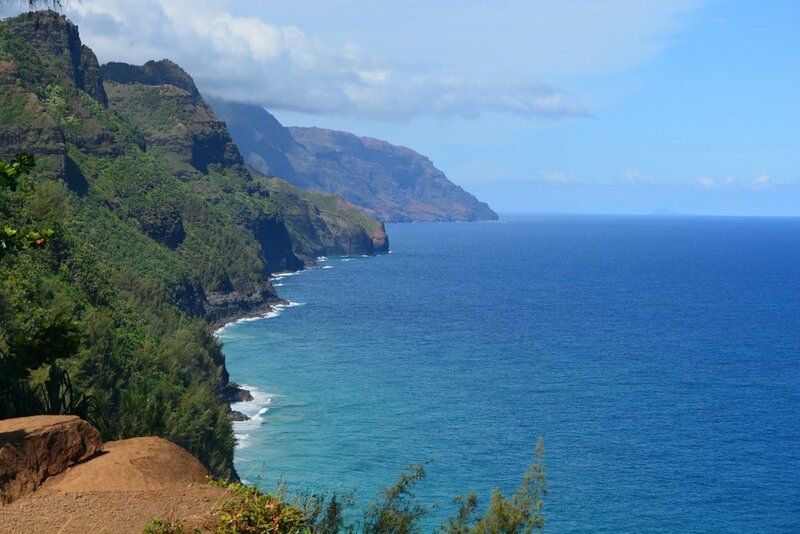 Seeing Kauai in 5 days: The Napali Coast, Queen's Bath, and more! I can't believe it's already been over three weeks since our girls trip to Kauai!! It feels way longer ago - I'm already ready for another vacation! :-P What I have the most gratitude for was how little I personally had to plan for the perfect trip. The other girls on the trip basically did all the planning and booking, so all I had to do was say yes to everything, which made it such an effortless vacation. THANK YOU LADIES! While I was only there for five days, I feel like we experienced many of the places that give Kauai its nickname ("The Garden Isle") - keep reading for our favorite spots! We stayed in a villa in Poipu, which felt pretty central to these spots (especially since Waimea and Napali are on opposite ends of the island), although we still ended up driving a decent amount to get to these places. But that's okay, because the drive itself is pretty! Queen's Bath is this amazing natural swimming pool right on the coast of the island, with crystal clear water, an unbeatable view, and the opportunity to cliff jump! You can only go swimming during low tide (check the tide report here - we went around 9 AM) so be safe! It's a pretty muddy/slippery trail down (I recommend anything BUT flip flops - barefoot would be better than that!) but it's worth it! When you get to the coast, go left along the coast and pass by two inlets, until you get to Queen's Bath. It's the first pool that is actually enclosed by rocks - you don't want to jump in to anything that goes freely into the ocean (like the below)! This (left below) is where you come out of the trail - NOT Queen's Bath! THIS (right below) is Queen's Bath! Weeeeee!!! The Kalalau Trail is the famous hiking trail along the Napali Coast - the only way you can access this part of the island, as there is no road. With beautiful ocean and cliffside views, access to secluded beaches, and , you can only imagine how popular it is! However, you can do what we did - an 8 mile round trip hike. Hike 2 miles to the first beach, and then take an additional 2 miles (detour) up to the Hanakapi'ai Falls. And then hike that all back to the parking lot. The whole thing took about 5.5 hours, including relaxing at the beach and falls. It's not the most strenuous hike, but it's definitely not flat, and I highly recommend sturdy shoes with good traction, as the hike to the falls takes you through four river crossings and over a ton of slippery rocks! Also super random - stray cats! We saw little black and tabby cats at the beach - how CUTE is this kitty? I don't even think I'm a cat person, but I seriously thought about taking this little guy home with me in my backpack! Even if you're able to hike the Napali Coast on the Kalalau Trail, it's super worth it to see it from another perspective. We unfortunately weren't able to go on our helicopter trip due to fog (I hear they go low through all those valleys and that it's TOTALLY worth the couple hundred dollars). BUT we did do this snorkeling/boat trip that took us up the coast, allowing us to really appreciate those majestic 4,000 foot cliffs. Napali (or "Na Pali") means "The Cliffs" - and seeing it by boat really gave us a chance to appreciate the moniker of this beautiful coast from a new angle! Our boat trip, through Blue Dolphin Charters, was so much fun. Our captain and crew were fun and helpful, and pointed out both views/spots that had native cultural significance and mainstream media relevance (i.e., Jurassic Park movie shots). AND WE SAW SO MANY SPINNER DOLPHINS. As soon as the boat started cheering for the dolphins, they began doing all these tricks, jumping and spinning in the air. I mean, is this real life? Obvi couldn't get a picture of them mid-air, but you have to trust me - it was priceless. The snorkeling was good - we saw several sea turtles and lots of fish - but the dolphins and the views of the Napali Coast from the water were the highlights of the boat tour. I can only imagine how cool it would be to be zooming through those cliffs on a helicopter! Alright, I feel like I can't really recommend Waimea Canyon because my friends went before I arrived in Kauai, but the pictures my friends took look AH-MAZING so how could I leave it off a "top things to do" list? Waimea Canyon is a 14-mile red rock canyon (nicknamed the "Grand Canyon of the Pacific") with lots of vistas that you can drive to, mini hikes for those feeling slightly active, and longer trails for seasoned hikers. Looking at these pictures (thanks Erika :-P), I know I HAVE to come back to Kauai at some point soon to see this myself! Obviously. I mean, I could name a specific beach - my favorites was Ke'e Beach and Poipu Beach - but they are all really good. Of course they are! It's freaking Kauai! Poipu Beach, right near our villa, was beautiful and small (which I like). The water was warm and clear, and you can definitely snorkel here! I only had goggles but did see a lot of fish! This was also where I realized the chicken in Moana is totally not random - there were roosters EVERYWHERE! It's like the Hawaiian seagull! I also heard great things about Tunnel Beach and Hanalei Beach from friends and family and people we ran into, but we didn't make it there - so if you have extra time, definitely explore those!